7 ft. This is close to a duplex Pan American jig. This is just for curious comparison. Also note the round hole in the center right of the box. Here is how they used this stone box for recovering Diamonds. First they cut and hauled these slabs of dolomite limestone from the quarries lower down in the valley. Bear in mind that this was the 13 or 14th century! 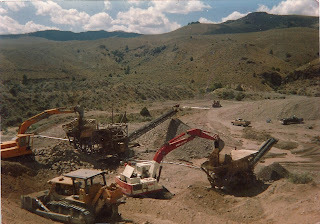 They brought these slabs to the middle of a diamond bearing area and set up these rudimentary recovery plants near the pits they excavated by hand. They positioned the slabs as you can see. They then mixed a molasses type of sealer and sealed the inside of this box water tight. They then blocked off the hole at the middle right of the photo. Next they hauled water from a well that was dug not far from this site,an impressive feat in its-self!! Next they would have filled this box half full with water. 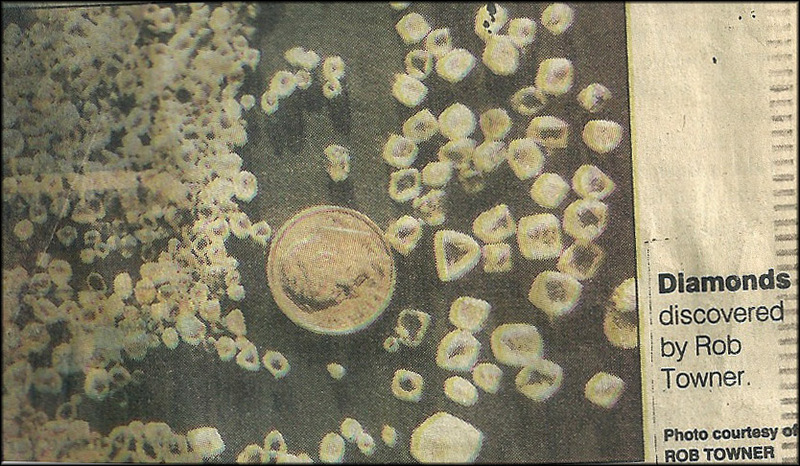 The ancient miners then hauled the gravel and rock they dug, and filled this box about half way with diamond bearing gravels. Then with sticks, small paddles, even their feet make a heavy slurry. 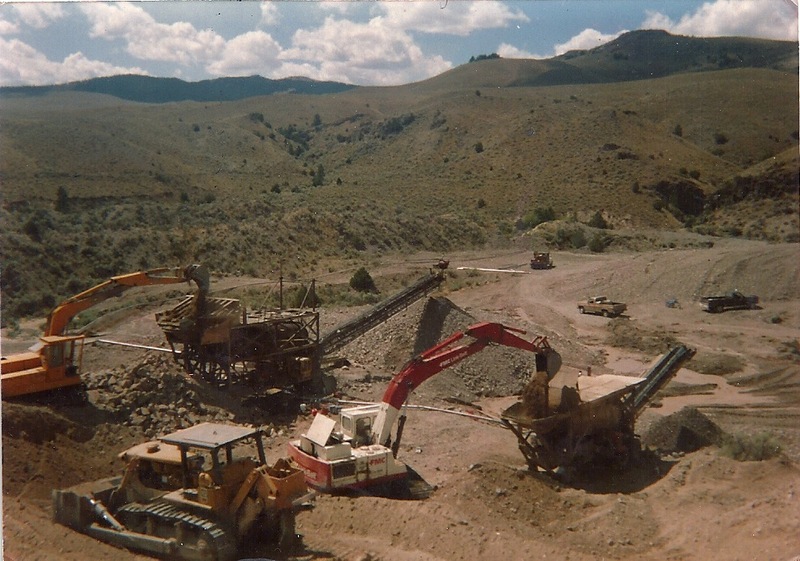 The purpose is to keep the slurry they created, agitated enough so the heavier specific gravity minerals would settle down to the bottom and this included the Diamonds. They would then pull out the plug at the upper center part of the box and drain off the upper slurry leaving a diamond rich concentration at the bottom part of this puddle box. The best part yet was that almost every one of these had another smaller puddle box right next to it to further re-concentrate the gravel!! Really ingenious of these people. 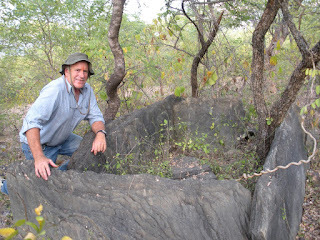 The gravels all around these boxes have heavy minerals and smaller Diamonds still being found today by local villagers. This Diamond field is where some of the most famous Diamonds in the world came from.Tavernier purchased many of his famous Diamonds for King Louis XIV of France from the village of Kollur just a scant half a mile away from where these puddle boxes were located, including the French blue, which many historians believe is the most famous Diamond on the planet the Blue Hope Diamond. Now this is Treasure Jungle Diamonds and Gold!!!!! 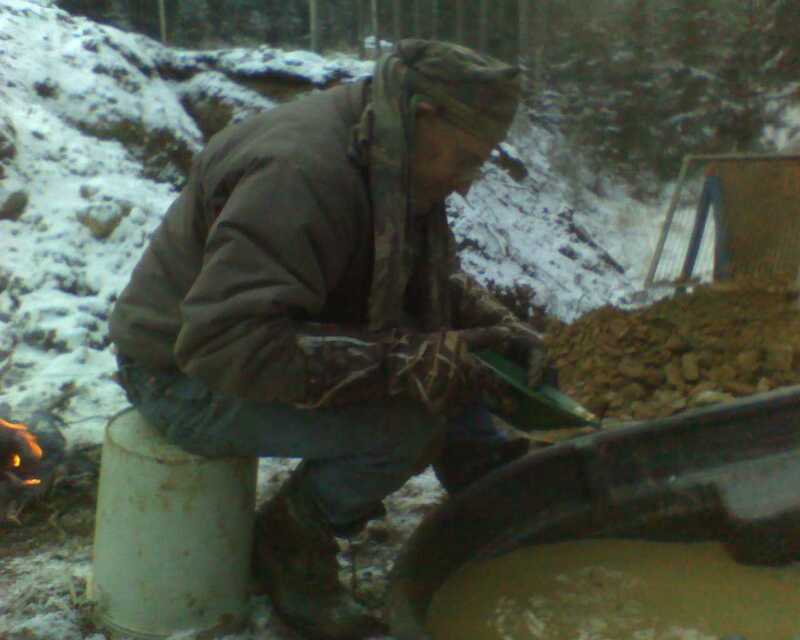 Above my buddy Wade is picking through the gold nuggets. He is not looking for the gold but is picking out the Diamonds we found. The suruca he is picking from is the same ones we used for the filming of Lost Treasure Hunter's on Animal Planet. You can see I am picking out and sorting the Diamonds we recovered that day in Venezuela. We found some very high quality Diamonds in this area. To this day I know that area has some of the best alluvial potential I've ever seen, and some day it will be exploited I hope!!! I want to be there again!!!! This was my trommel and jig plants I used on Grasshopper creek. This equipment I had was completely refurbished and sent to South America. This is a very good template for a mining operation of 35 to 60 yards per hour. The trommel is a good choice depending on the material you have. A quadraplex jig for a rougher and a Pan American duplex jig to pickup the gold and smaller Diamonds. 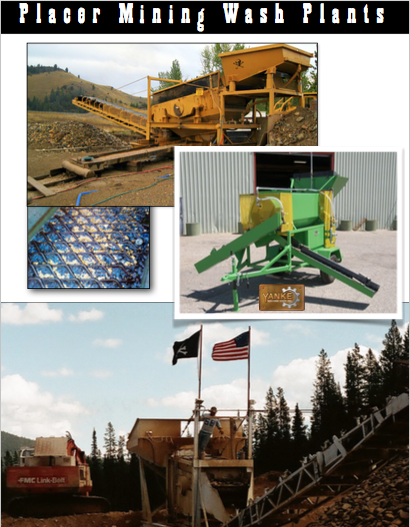 Gravel pumps to deliver material to the Jig and another to get rid of your tailings. 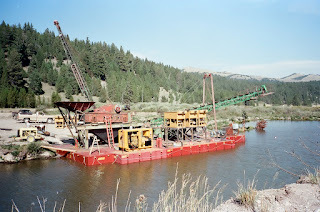 This was one of my operations I had on the Bon Accord on Grasshopper Creek about 1991. I had Both of my trommels working on the North side. This was some very low grade ground but it was enough to keep us going. There was a nice bench here that lasted a few weeks. The gold was very fine flat and flakey. Most of it passed a 60 mesh screen. These trommels were workhorses for sure. I had just setup a vibrating screen wash plant down below here and we took out over 500 ounces in 6 weeks from a pocket on a perched tertiary channel. The price of gold was pretty low back then. The secret here has always been.......... stay obsessed with rock in the box. Production is a key, for sure. I sure would like that kind of ground again at todays prices!!!! This is some Cassiterite I recovered from a placer gold deposit we had leased some years back. With a high specific gravity of about 7, these tinstones were easily recovered in our recovery system. Cassiterite is a lowgrade constituent of igneous rock and is re-concentrated in many parts of the world by alluvial dynamics. 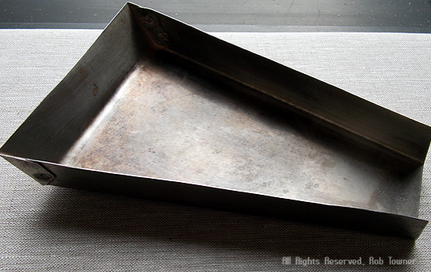 This is a type of tinstone is commonly referred to as Wood Tin. This cassiterite is Botryoidal. You can see the precipitation rings on the upper center of my photo, these growth rings resemble a freshly cut piece of timber hence the name Wood Tin. Most of the major cassiterite producers are in Malaysia, Indonesia, and Thailand even England was a historical producer in the Cornwall area. I am a tremendous fan of the Clarkston report. I usually start out with miners moss at least a half inch thick. Every deposit has a characteristics that are different, meaning the blacksands may be fine, these tend to pack the riffles, combine that with flat and flakey gold and you are going to have serious recovery problems. This shot above shows a good recovery with indoor outdoor carpet. While I am not a fan of this type of carpet, it seemed to work very well with this type of gold and the feed rate we fed the sluices with. It is always a good idea to observe every aspect of any recovery plant. You may see a clue that will help in your own recovery efforts. For this type of gold, the indoor outdoor carpet worked well. Operators of plants tend to get a favorite matting, but from my years of overall experience the miners moss is usually the very best choice. I tend to stay on course with that, but occasionally I will put something new into my circuits for sure, to check it out. I can build a washplant based on your budget. This means a used plant or a plant from all new components. It's up to you. 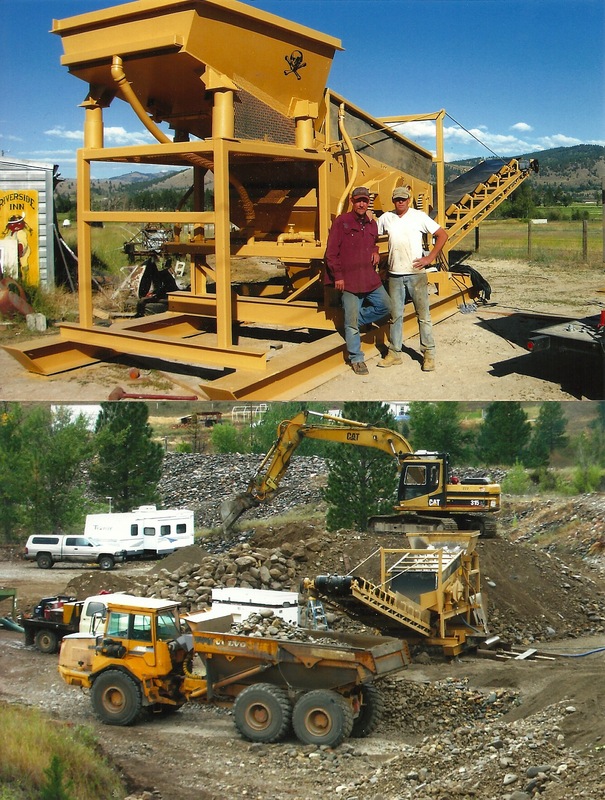 Believe me, I have extracted thousands of ounces over the years and I know how to build a washplant that puts rock in the box. I build wash plants in between my mining seasons. I have a mobile plant plant right now puts out about 45 to 65 yds per hour depending on the clay and size fraction to the recovery system. On this plant I am using sluices. 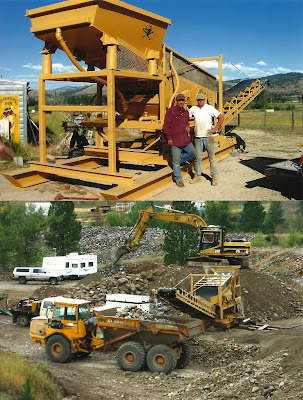 We later used a gravel pump and it assisted in liberating additional gold for our project. I can get a plant out in about 4 weeks time that is a hopper, vibrating screen, sluice box and a conveyor stacker. This one would be around 45 yards to 60 yards per hour. Additional recovery would be by customer order. My equipment is always run by Generator set power. Also with clays I strongly suggest gravel pumps. 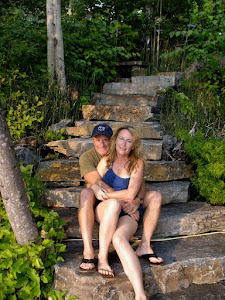 You can go to my website blog and see the many types of plants I have built and associated recovery systems. I have had a lot of experience putting together trustworthy plants that get the target mineral. Alluvial Diamonds and Gold are my specialty. Let me know what you are looking for and we do have a window to put something together or do some onsite consulting. Call me at 406 530 9172 to set up a consultation. I'm always prickin with the jungle creatures! There is always something banging scratching or rattling around my tent or camp in the jungle every flippin time I go somewhere. Truth is.... I love it. Bug of the week is my favorite saying out there. I did a small job in Panama last summer and we had a bunch of cicadas hatch and the nights were very noisy and very fascinating! I caught this beautiful creature and after a good look at him I released him back into the hot humid night air of Panama. This was a big boa snake that kept hanging around the dredge site we were working on. I for one don't like the surprise of one of these snakes anywhere around my worksite on or off water. In Venezuela snakes usually mean the chance of being bitten, not maybe but when. I don't care what kind of slithering reptile it is around my work area kill it, capture it or get it away from camp. Around the water its even worse!!! The men on this project were among the best at keeping them away. The locals fear snakes and I am with the best of them!! Just seen to many, or I'm gettin old! !